InLoox PM 7 offers a preview of documents and images with an installed preview handler. Click on the Documents page, in the document list, the line of the respective document. You find the document preview in the window on the right. For more information on how you can find the Documents page and for more detailed information on the topic, please see Work with the document list. 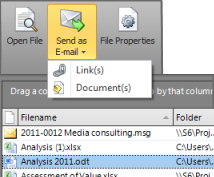 Now, you can send your project documents directly from the InLoox PM documents folder as e-mail. Mark the respective document on the Documents page in the list. 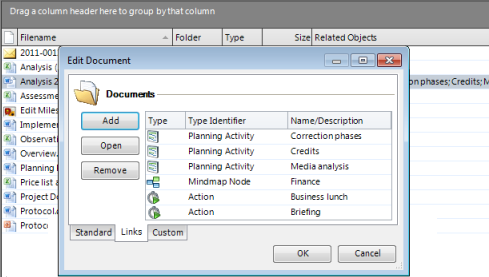 Then click Send as E-mail on the Edit tab in the Documents group. Choose whether you want to send the document or the documents as Link(s) or as Document(s). Then, you can add the recipient of the e-mail and, if you like, additional text and you can distribute the document as an e-mail. For more information on how you can open the Documents page and on the topic, please see Work with the document list. The InLoox PM document list now offers a current overview of all project documents and document links in use. So, you can navigate directly from the document list to the linked mind map, planning or time tracking element or open the related project document directly from the element. For more detailed information on this topic, please see Create and edit a document and the respective help categories. New documentation features in InLoox PM 7 • Copyright 1999-2019 © InLoox, Inc. All rights reserved.